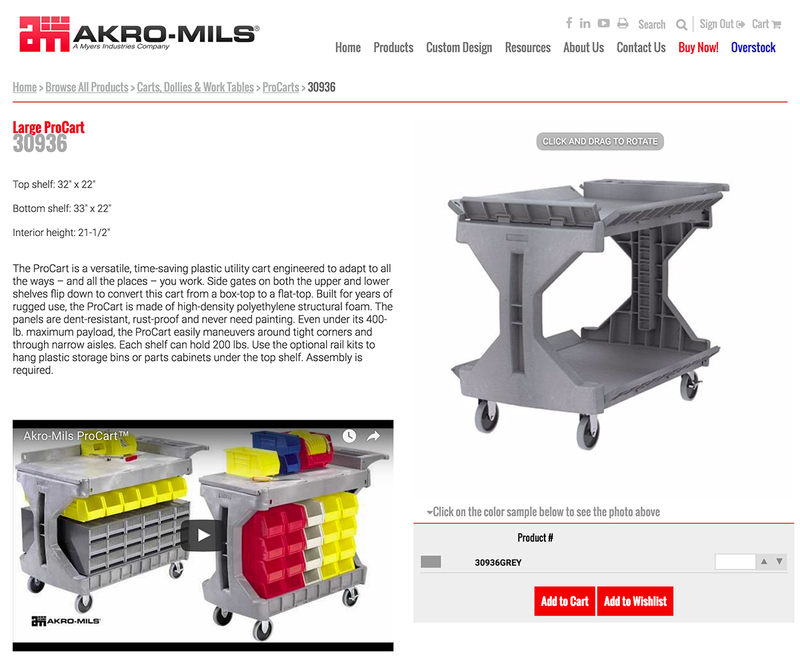 Akro-Mils, a North American leader in storage, organization and transport products, introduces new 360-degree rotating images to several leading product lines featured on its website at http://www.akro-mils.com. Rotating images are now available for Akro-Mils’ industry-leading AkroBins®, 4” Shelf Bins, Louvered Hanging Systems, Plastic Storage Cabinets, and ProCart™. Page viewers can rotate the image at their own pace to examine the product. Check back for additional 360-degree images as they are added to the site! For an example of the new rotating images, visit https://akro-mils.com/Products/Types/Plastic-Storage-Containers/AkroBins/AkroBin-30230. Akro-Mils is a leading manufacturer of plastic and metal storage, organization, transport and material handling products for use in industrial, medical/pharmaceutical, commercial and consumer markets. Akro-Mils is dedicated to providing innovative, quality products that help customers improve inventory control and overall efficiency. Located in Akron, Ohio, Akro-Mils is a Myers Industries, Inc. company. For more information, please call 800-253-2467, fax 330-761-6348, or visit http://www.akro-mils.com.